Published March 26, 2010 at 400 × 292 in Art. 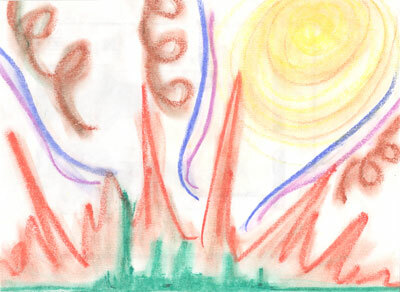 This picture I drew at a care group that I was co-leading for children. During the worship time we had flags, art supplies, instruments ect., for the kids to use to express their worship to God. I asked the children to help me listen to God for what to draw. I would ask them what color they felt the Lord was saying to use and then I picked up that color and drew what I felt the Lord was telling me. This was the result and I believe that it is representative of a city on fire for God in revival. I believe that the brown squiggles are representative of the Holy Spirit moving, and that the blue and purple is God bringing His revelation down to the people of the city represented by the green.